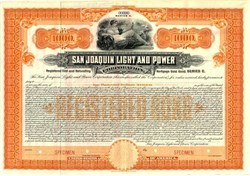 Beautifully engraved specimen $1000 Gold Bond Certificate from San Joaquin Light and Power issued in 1910. 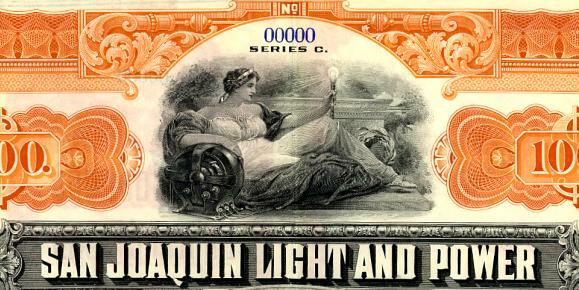 This historic document was printed by American Bank Note Company and has an ornate border around it with a vignette of an allegorical woman holding a light bulb. This item is over 97 years old. The San Joaquin Light & Power Corporation had its beginnings in 1895 and then expanded to serve the rapidly-growing light and power needs of the San Joaquin Valley. The San Joaquin Light & Power Corporation provided electricity to seven San Joaquin Valley counties and also supplied the electrical current distributed by the Midland Counties Public Service Corporation in Monterey, San Luis Obispo and Santa Barbara Counties. The San Joaquin Light & Power Corporation had its beginnings on 1 April 1895, as the San Joaquin Electric Company, when the company built Powerhouse No. 1 on the San Joaquin River thirty-seven miles from Fresno. The company, however, declared bankruptcy in 1899. William C. Kerckhoff and A. C. Balch purchased the company in 1902. They renamed and incorporated it as the San Joaquin Power Company on 13 May 1905. Albert G. Wishon was named manager. The company became the San Joaquin Light & Power Corporation in 1910. It was to play an important role in supplying electricity to Fresno and the rest of the San Joaquin Valley, where large areas were being farmed and towns were being established and growing in response to the booming agricultural industry. The San Joaquin Light & Power Corporation played a crucial role in the growth of the San Joaquin Valley as the leading agricultural force in California. By 1920, the San Joaquin Light & Power Corporation was an established and significant public utility, with eleven powerhouses and a vast array of transmission lines throughout the Valley. By 1930, the San Joaquin Light & Power Corporation had merged with the Great Western Power Company, and both became part of the Pacific Gas and Electric Company.